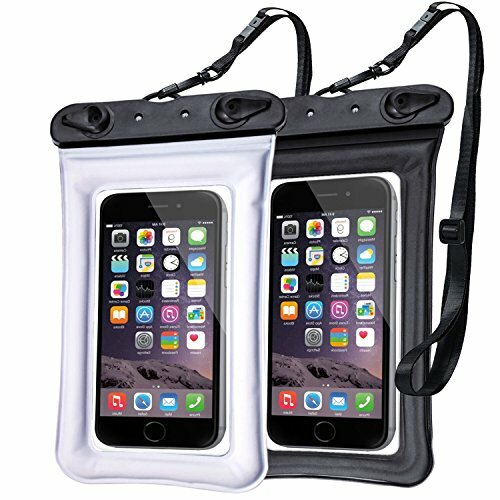 Waterproof Phone Pouch Case (set of 2!) ONE RED HOT PRICE! Free Shipping! Use coupon code RPVZ37CQ for $7 off! FLOATING WATERPROOF DRY BAG POUCH → The air circle padding around the pouch makes your cellphone float on water to keep you easily find your phone. Please conduct the waterproof test before underwater use. Any issue, please contact us freely. IPX8 CERTIFIED WATERPROOF → Keep your phone, cash, cards, and carry-on documents dry and clean for beach, fishing, swimming, boating, kayaking, snorkeling and water activities. Please tightly sealed the waterproof bag before underwater use. DURABLE & SECURE DESIGN → With the durable lanyard , you can hang it around your neck while swimming, surfing, boating, fishing and more. PVC materials ensure durable use with scratch resistance. EASY TO TOUCH AND SHOOT → Premium TPU material works with all the HOME buttons. With transparent window, you can use the volume buttons to take clear pictures or videos underwater. UNIVERSAL WATERPROOF CASE → Compatible with devices up to 6 inches including: iPhone x/8/ 8 plus/ 7/ 7 plus/ 6S/ 6/ 6 plus; Galaxy S9/S8/ S7 Edge/ S6 Edge Plus; Google Pixel/Pixel Plus, HTC, HUAWEI, LG, etc.